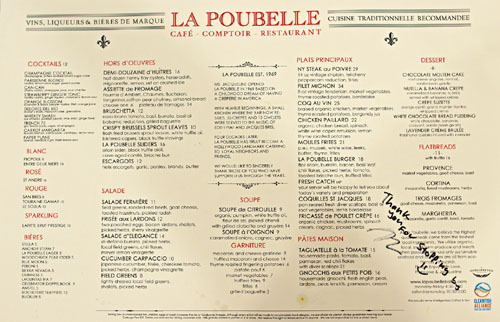 The story of La Poubelle (literally "trash can" in French) begins all the way back in 1969, when it was started by one Jacqueline Koster (whose daughter Francoise Koster now handles the day-to-day). Initially, it functioned as a creperie, but gradually evolved into a neighborhood-type bistro largely catering to the Hollywood set. Though the restaurant always had a good local following, the food was never anything to write home about. 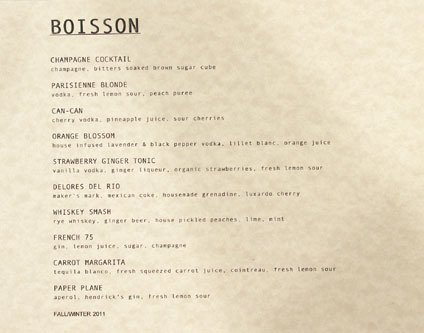 The Kosters, however, decided to change that earlier this year by hiring new Executive Chef Johnny Zone, who's been tasked with refining and modernizing Poubelle's menu, in addition to overhauling both the kitchen and front-of-the-house staff. About the Chef: A California native, Johnny Ray Zone began his culinary career as an apprentice, working as a garde manger at Figaro Bistrot in Los Feliz. Following, he helped debut Hans Rockenwagner's 3 Square Cafe + Bakery in Venice, then became part of the opening team at Gordon Ramsay at The London. During his tenure there, Zone cooked under Haru Kishi (currently at Chaya Brasserie) and Andy Cook, while the restaurant received one Michelin star. Simultaneously, he also worked at Nobu West Hollywood, where he sharpened his skills in fish butchery. 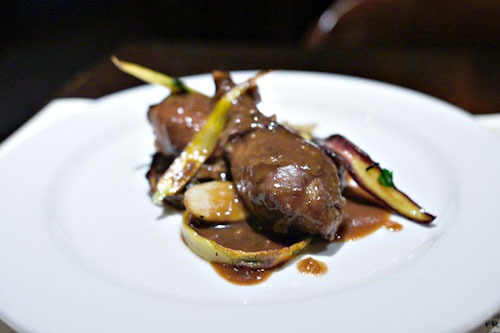 In 2009, Zone joined Thomas Keller's team at Bouchon Beverly Hills, where he was able to learn the intricacies of bistro cooking. Armed with this knowledge, Zone took over the kitchens at La Poubelle several months ago, and has already achieved some success in turning the restaurant around; his coq au vin was even featured on Food Network's The Best Thing I Ever Ate (as chosen by Curtis Stone). Inside, things are bohemian and a bit well-worn, not unexpected for a comforting French neighborhood café. 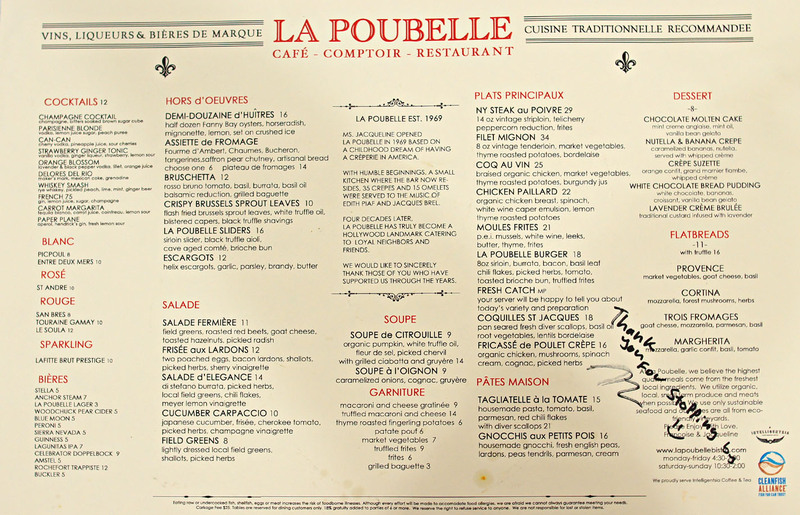 La Poubelle's menu features many of Zone's new dishes, though there are still a good number of holdovers from before (but even they've been updated). Given that I was at a special media tasting, the Chef prepared a custom degustation, meant to highlight various points on the carte. Click for a larger version. 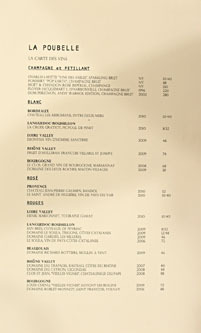 To drink, we're talking about a small list of French wines, as well as a respectable cocktail selection. Click for larger versions. 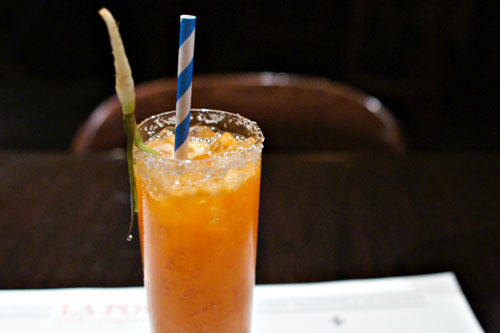 Speaking of cocktails, I started off with a surprisingly palatable Carrot Margarita. 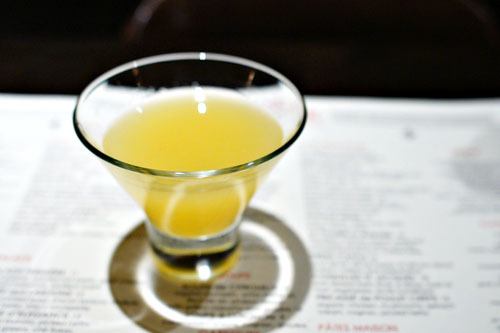 I was afraid that the carrots would be way too sugary, but they were actually very subdued, providing only a hint of sweetness to accent the core interaction between the lemon and tequila. Brussels sprouts, of course, were a must, with their trademark bitterness nicely balanced by the earthiness of truffle. My complaint here, though, had to deal with texture. I needed more substance, more weight to the dish. I wanted to enjoy the crunchy consistency of the sprouts, so I think including some actual chunks of the veggie would work wonders. 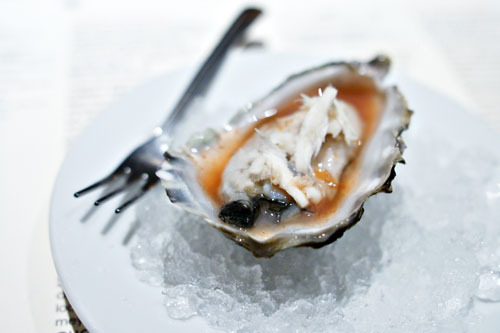 A singular Fanny Bay oyster was spot on perfect: firm, meaty, and satisfying in texture, with a sweet and refreshing relish that went superbly with the accoutrements of mignonette and horseradish. 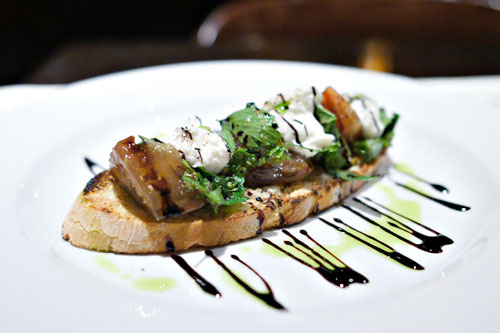 Zone's bruschetta was a prime example of the dish, showing off fresh, classic, Caprese-inspired flavors anchored by the perfectly toasted bread and lush Di Stefano burrata. The pumpkin soup was perhaps the biggest surprise of the evening, because, not being a fan of pumpkin, I quite enjoyed it. The key was how the sweetness of the squash was balanced by the essence of truffle and a slight piquancy from the chervil, while the sea salt made itself known on the close. 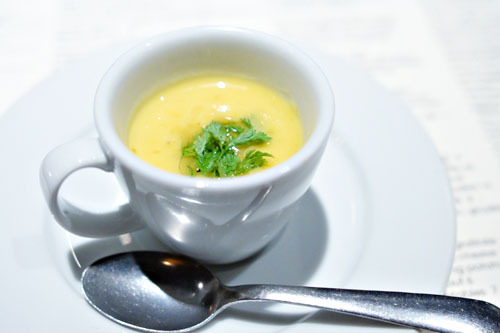 A nicely integrated potage, it actually reminded me of a pumpkin soup that I'd had at Guy Savoy, which is a good thing. 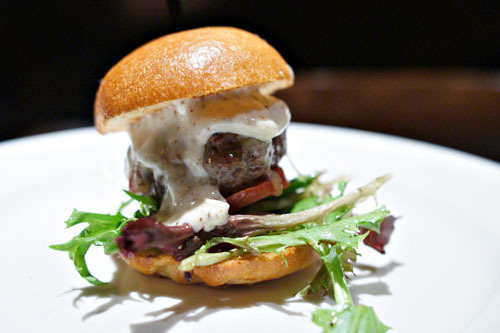 The slider was a highlight of the dinner; in fact, it was one of the best versions I've had in a long while. The meat itself was pretty monumental--juicy, succulent, and with a wonderful beefiness that paired perfectly with the four-year aged Comté. Arugula, meanwhile, provided a countering astringency, while the dish was finished off by delightful overtones of truffle. Very nice. 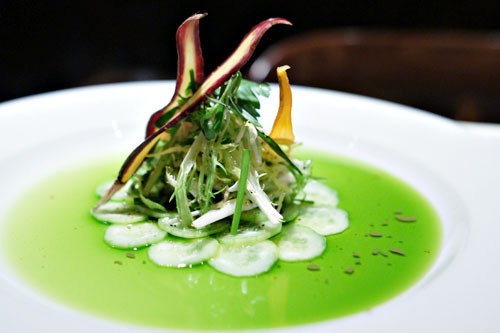 A carpaccio of cucumber was light, yet substantial at the same time, with the basil oil and vinaigrette adding body and depth to the dish, serving and a counterpoint to the levity of the various vegetables at play. I was intrigued by the Orange Blossom's homemade infused vodka, and it didn't let me down, showing off a marked pepperiness on the attack, with the wonderful floral notes of the lavender coming in later to balance out the weight of the booze. 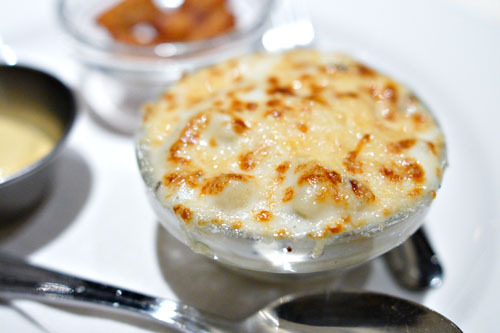 It's hard to miss with truffled mac 'n' cheese, and certainly, this version was one of the strongest I've had, with a great truffle essence to moderate the considerable cheesiness in the dish. Loved the crisp crust, too. 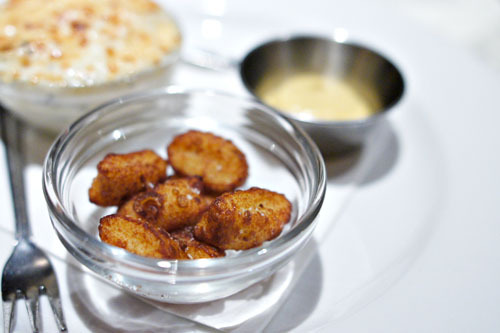 Along with the mac 'n' cheese came patate pouf, which are basically fried bits of potato gnocchi. They were soft, doughy little bites, mild but with a hint of salt. Great with a touch of the included Dijon mustard. The adjacent table contained some interesting characters. We had Florence Charmasson, Joe Petricca (Executive Vice Dean of the American Film Institute Conservatory), and funny man C.M. Schwartzy (one half of comedy duo Schwartzy and Pagana--Andy Pagana also joined us later in the meal). Oh yeah, and Josh Hartnett was at the bar. 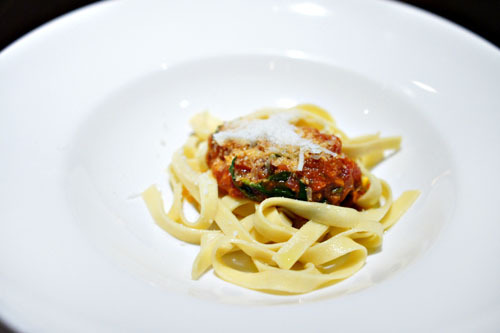 Ever since training under Loredana Cecchinato of Osteria Mamma, Zone has been making all his pastas in-house. The effort seems to be paying off, as the pasta was on point texturally. Flavor-wise, think classic tangy tomato tastes, but with a delightful creeping spice and a nice basil accent. 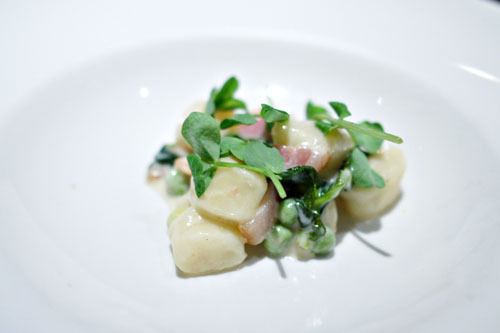 Gnocchis were also housemade, and this particular preparation was ostensibly inspired by Mamma's "Gnocchi del Boscaiolo" dish. It compared very favorably to the original. The dumplings themselves were soft and pillowy, light yet dense at the same time. 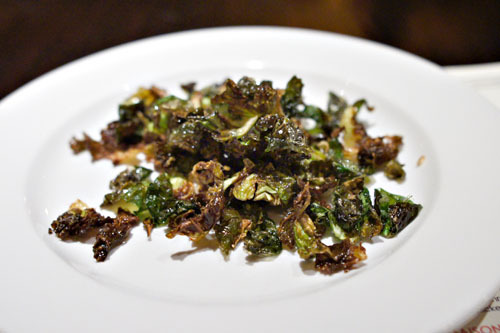 They served as a fitting base for the interplay between the fresh, bright flavors of the peas and the salty lardons. 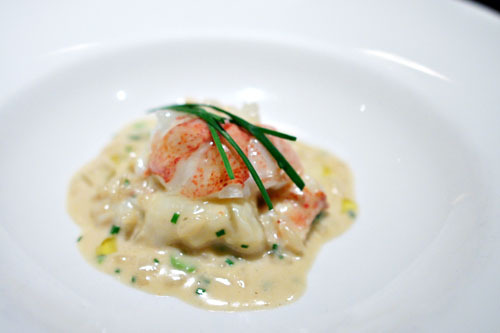 The lobster risotto was a special of the evening, and obviously a must-have. The crustacean itself was perfectly cooked, with a fresh, supple, snappy consistency and a deliciously sweet brine that paired flawlessly with the veggies. As for the rice, it was pretty much spot on as well, and served as a great textural foil to the lobster, though I would've liked more of it. Time for another cocktail. 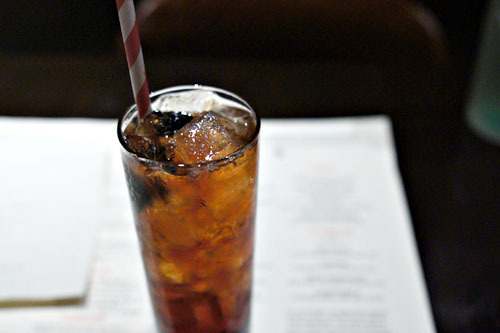 The Delores del Rio conveyed a straightforward, but effective interaction between the bourbon and cola, but what made this interesting was the combined sweetness of the grenadine and cherry, which gave the drink a nicely sugary undercurrent. As we can see, Florence rather enjoyed Delores as well. 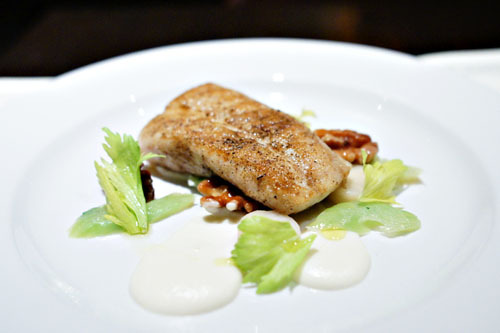 The fish of the day was halibut, which was served here with celeriac purée, celeriac disks, celery leaves, and walnut. Though I have a noted disrelish toward celery (and celery root, to a lesser extent), the veggie actually made pretty good sense here, balancing out the savoriness of the fish. My concern was the walnut, which didn't quite make sense to me, and actually detracted from the dish. Steak au poivre was fairly traditional in presentation. For the most part, the beef itself was tender, with a satisfying, restrained meatiness that paired well with the pure, focused, yet unobtrusive flavors of the pepper sauce. 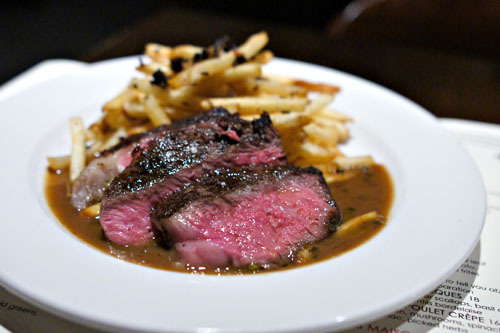 Accompanying the steak were thin, crisp truffled pommes frites. And now, Zone's pièce de résistance, the coq that landed him on the Food Network. I can see why, as it was the best version of the dish that I've had. The bird was remarkably tender, pretty much falling-off-the-bone, with deep, dark, savory flavors backed by a hint of sweetness. The vegetables, meanwhile, served as a great temper to the sheer richness of the dish. Definitely worth a try. 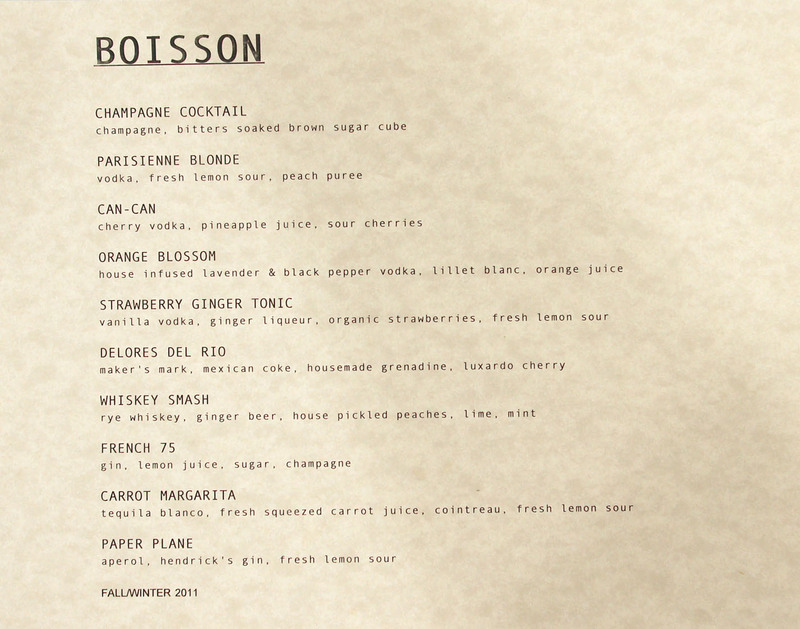 The Paper Plane was the last drink of the night, and arguably my favorite. 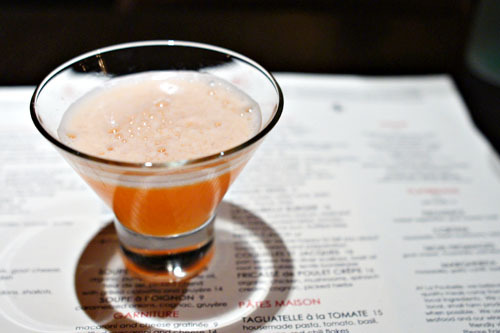 I'm a fan of Aperol, so here I loved its bittersweet flavors, played off the zestiness of the gin and lemon. A small selection of cheese before dessert. 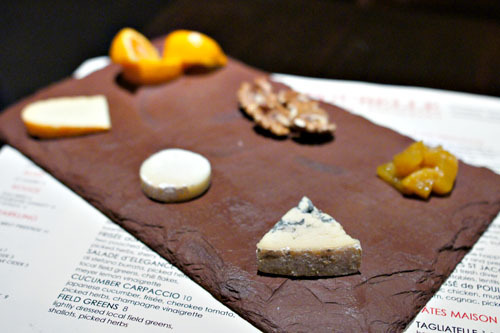 The Fourme d'Ambert showed off your expected blue flavors, while the goat's milk Bucheron had an almost creeping sweetness that I liked. My favorite here was probably the Chaumes though, a soft, cow's milk cheese with a lovely lactic tang and marked saltiness. Zone brought out a selection of mini-desserts, the first of which was this tiny Crêpe Suzette, very classic in flavor, with a deft mix of sugary and tart flavors to go along with the miniature pancakes. 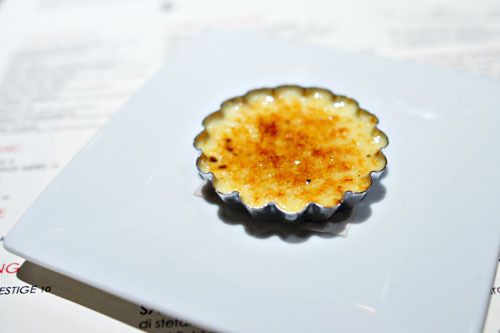 A lilliputian raw sugar crème brûlée was up next, with a subtle floral essence infused in the custard that I appreciated. Nice crust, too. 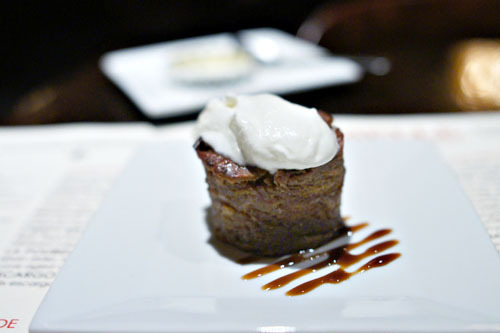 Bread pudding was nice, not too heavy, with a charming, fruity sweetness to go along with the dessert's creamy topping. I just wished I tasted more of that white chocolate. 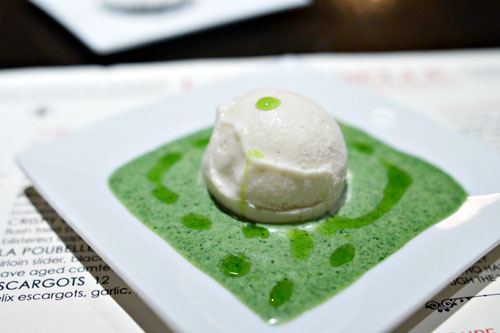 A vanilla gelato was rather endearing, displaying the pure, unmitigated essence of vanilla bean, moderated by the bright zing of the paired mint sauce. 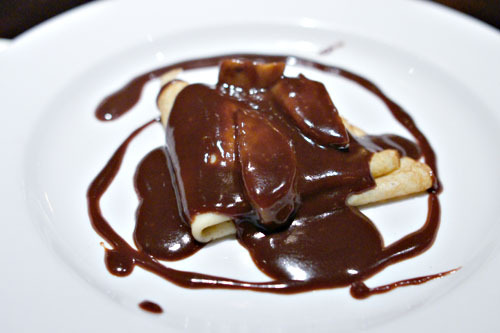 To close, a traditional crepe of nutella and banana. Not terribly exciting, but it's hard to go too wrong with the sweet, nutty flavors here. 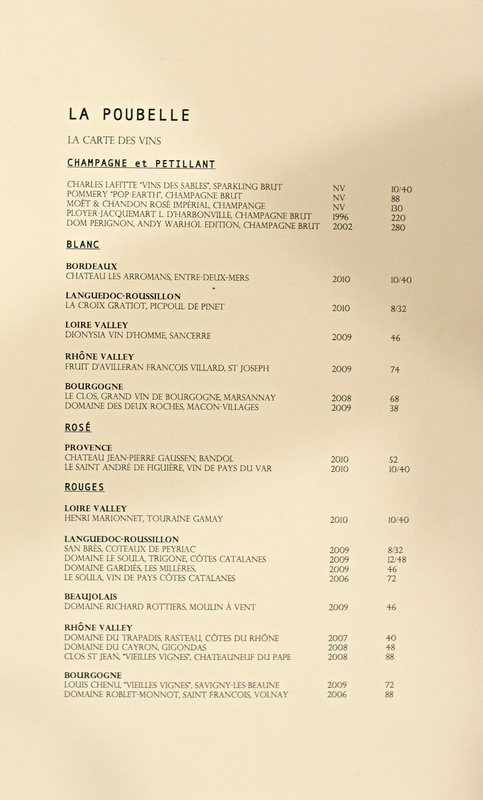 If you'd asked me to come to La Poubelle earlier this year, I'd probably have outright refused, given the restaurant's reputation for its humdrum, middling French fare. 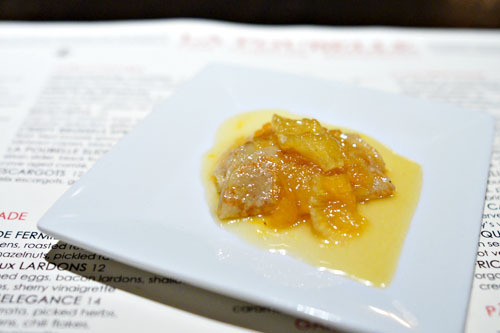 However, these days Chef Zone looks to be making some real changes around these parts, infusing the food with some of the flair, refinement, and panache he garnered in the kitchens of Bouchon and elsewhere. Now, we're talking about some truly respectable bistro cooking, which means that, for the first time in years, you'll actually be able to come here for the ambiance and the grub. I do hope that the Chef can keep it up, as I think the food will only get better with time. 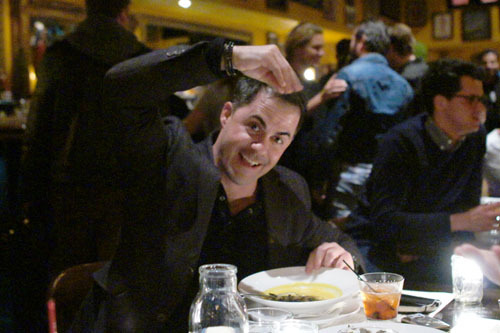 As someone who was there to witness it all, I must say... Kevin takes his food criticism very seriously. All the jazz hands in the world couldn't distract him... as hard as I tried. Nice work, Kevin - and great meeting you!! love it! Huge fan of Schwartzy and Pagana too! This looks like an amazing transformation. I did think they had one of the best beef carpaccios on the old menu and they used to have some more interesting beers, like La Goudale, but this new menu looks extraordinary. I'm there! Thanks for the heads up, K.
Looks delicious. Can't wait to try that Coq. Thanks Kevin. Jordan: Nice. Have you had the pleasure of meeting Schwartzy and/or Pagana in real life? SaltCod: Hmm, never had La Goudale before--too bad it's off the menu then. S Lloyd: Poubelle is good for bistro fare, though I can't say it compares to the Michelin three-star places that you frequent! Anon: Ah yes, there is some good coq to be had here indeed!